Last Friday, my sister and I had lunch at Lydia's lechon in Baclaran. I was only supposed to drive her to the bus stop (She is taking her review classes in Makati and Baclaran is where she takes the bus going there), but on our way there, she mentioned she always wanted to eat lechon at Lydia's. And who wouldn't, after seeing lechon being cooked along that busy little row in Baclaran? She said the only thing that stopped her from ducking in that restaurant for lunch is her concern that to finish a meal there, it is best to share it with at least one person. So for days, my sister harbored this craving for lechon and she patiently waited for that moment when she could drag that one person with her to treat her to a lechon meal at Lydia's. Last Friday, that person was me. When we got there, we immediately ordered 1/4 kilo of lechon and seafood paella. We also browsed through the turo-turo section of the restaurant where lots of tasty looking food are just waiting to be picked. But that day, we were fixed on having lechon and paella for lunch. The waiter assured us that the paella serves two to three persons, but when it arrived, it was obvious that it served at least four persons. No way could only two people finish that feast of delicious red rice and seafood along with a serving of lechon! The food was excellent. 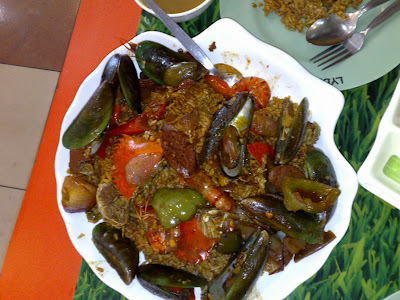 Although quite different from the paella served at authentic Spanish cuisine restaurants like Casa Armas and La Solera, Lydia's seafood paella has its own charm. I particularly liked the distinctive flavor of paprika in the paella and the generous portions of chorizo tucked in every nook and cranny of the dish. It was rice and viand on its own, and it is quite conceivable that without the lechon, two people can finish it in one sitting, as the waiter claimed. The lechon is fantastic, no surprises there. The skin is perfectly cunchy and the meat is juicy and very tender- and we're not even talking about lechon de leche or lechon Cebu here. Oh, and the sarsa (liver sauce)- it is a far cry from the commercial grade bottled variety. It is deliciously sweet and savory, a perfect complement to this expertly roasted lechon. I swear, you can almost taste how wonderful the lechon paksiw is going to be- on the off chance that there is any lechon (or liver sauce for that matter) left over, that is. 1/4 kilo of lechon cost Php135 while the seafood paella cost Php450. Our drinks cost us Php21.45 for a bottle of regular Coke and Php29.50 for a bottle of Hidden Spring Mineral Water. Prices are VAT inclusive. Lydia's Lechon restaurant can be found at Baclaran, Metro Manila near the Redemptorist Church. Hmmmm ang sarap ng lechon. Nagugutom tuloy ako. Kapag lechon na ang pag uusapan panalo ang lechon sa cebu. Sa lasa at sa crispy ng balat walang katulad. Wala talagang tatalo sa lasa ng lechon sa cebu. We all know that the tastiest lechon was in cebu. Yes lydias lechon in baclaran taste good. And its much tastier if theres a liver sauce. But in lechon cebu you don't need to put liver sauce or mang tomas on it because its tasty already. The tender juicy meat and the crunchy skin was sooooo yummmy. Its very delicious. The taste was great! Lechon cebu is really the best lechon. The tasty meat and crunchy skin wow its yummmy. Lechon cebu tastes really good. You no longer need sauce to experience the good taste. The meat and the crunchy lechon skin are enough. And to add up, the people there were so cool and hospitable. Lechoncebu lechon is quite different from the lechon that can be seen in Luzon. You don’t need to have a sauce or gravy. Cebu has been insisting on their best taste lechon. of course, as Manila wanna be, they always want to steal the limelight. As for me, Lydia's Lechon is still the best, needless to say, you will see back then that Henry Sy, actors and actresses and even the Marcos family eat Lydia's Lechon. They even order more than 300 lechons for the birthday celebration of Marcos. 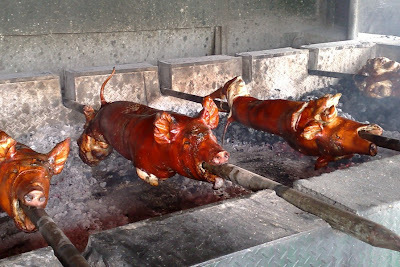 With their almost 50 years in existence, Lydias is synonymous to lechon.